2015 Mercedes-Benz C-Class Coup revealed - pricing, engines, equipment and Mercedes-AMG versions | What Car? This is the second-generation Mercedes-Benz C-Class Coupé, which is on sale now with the first examples arriving in the UK in December. The C-Class Coupé is the two-door version of the latest C-Class Saloon. It shares the same basic front-end style while from the rear it closely mimics the design of the latest S-Class Coupé. The new model is 9.5cm longer and 4cm wider than its predecessor, so the cabin is more spacious. Inside, you’ll find the same stylish dashboard and switchgear as that in the latest C-Class Saloon. However, the new coupé receives unique front sports seats with integral headrests as well as two individual rear seats. There is also a standard automatic belt feeder similar to that used by the E-Class Coupé. The C-Class Coupé will come with the choice of two petrol models at launch: the 181bhp C200 and the 241bhp C300. The C200 comes with a six-speed manual gearbox as standard and is available with a seven-speed automatic as an option. The C300 is only available with the seven-speed automatic. Also available from the start will be a 2.1-litre four-cylinder diesel engine with either 168bhp in the C220d or 201bhp in the C250d. The C220d comes with a six-speed manual gearbox, but customers can choose a nine-speed automatic as an option. The nine-speed auto’ is standard on the C250d. Alongside standard rear-wheel drive, the C-class Coupé will also be available with optional 4Matic four-wheel drive in combination with selected engines. Mercedes-AMG C63 models get a 4.0-litre V8 petrol engine connected to a seven-speed automatic gearbox. The C63 produces 469bhp and gets to 62mph in 4.0 seconds. The C63 S manages 503bhp and knocks 0.1 seconds off the 0-62mph time. All models get parking sensors, LED front and rear lights, a reversing camera, heated front seats and sat-nav. Also on board is Mercedes-Benz’s Attention Assist function, which warns the driver of inattentiveness and drowsiness. It is joined by Collision Prevention Assist, which is able to carry out autonomous braking at speeds of up to 124mph in combination with a further standard system called Adaptive Brake Assist. As part of Mercedes-Benz's efforts to establish itself at the forefront of autonomous driving technology, the new model also comes with an optional Distronic Plus system. 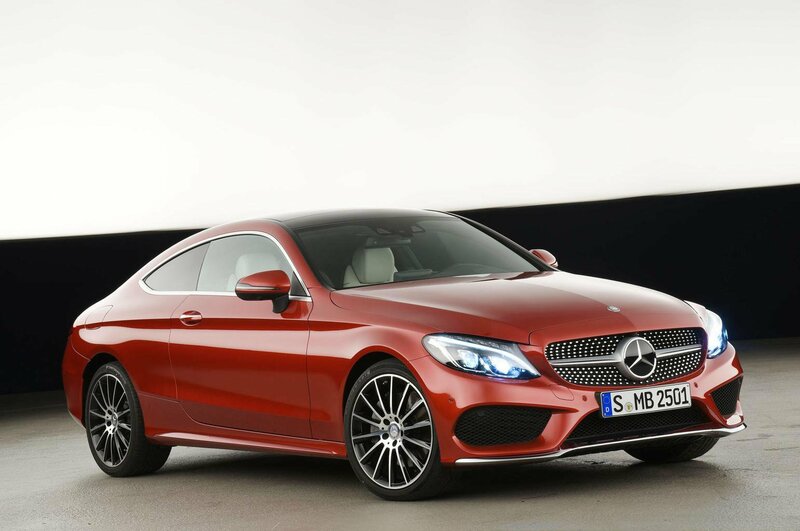 It enables the new C-Class Coupé to autonomously steer to remain in its lane at speeds between 0 and 124mph. Sport models get black interior trim, 17-inch alloy wheels and black-painted pins to the grille. AMG Line models get wood trim, black roof lining, sports pedals and steering wheel, 18-inch alloy wheels and lowered sports suspension. The C200 starts at £30,995 and is available to order now. The first cars will arrive in the UK in December this year. The Mercedes-AMG C63 and C63 S cost £61,160 and £66,910 respectively. You’re unlikely to find one immediately, but there are discounts of around 10% available on the outgoing car so we expect discounts to appear soon after the new car goes on sale. The BMW 4 Series is its biggest rival and it’s very good. It’s fun to drive, practical, well equipped and surprisingly good value, all of which has earned it a four-star rating.